One thing that I have in common with a lot of women is that I’ve been terribly heartbroken in the past. To this day I remember how I felt during my last breakup. I asked God to restore the lust my bad ‘love’ my boyfriend and I had for each other and prayed everything would get back to normal. One week, two weeks, even three weeks later but the Ex hasn’t been touched by the Holy Spirit yet. Hmm, that’s odd. I wondered what happened and felt like God had withdrawn his blessing from my relationship. So I got annoyed and accused God of misleading me. ‘But I thought he is “The One” and we are meant to be?’, ‘You said “whoever finds a wife, finds a good thing” and he found me on Instagram!’ (let’s be honest, that’s a good point). But no matter the fussing and fighting, the verdict was out. He’s not ‘The One’ God has for you! Now what? Even though a ‘no’ is not always what you want to hear, God will say it at times. And I believe that there’s no need to be discouraged. Because a godly “No” can be very powerful and helpful to your growth. Remember that every time God says “No” he has a good reason why and you just need to trust Him. 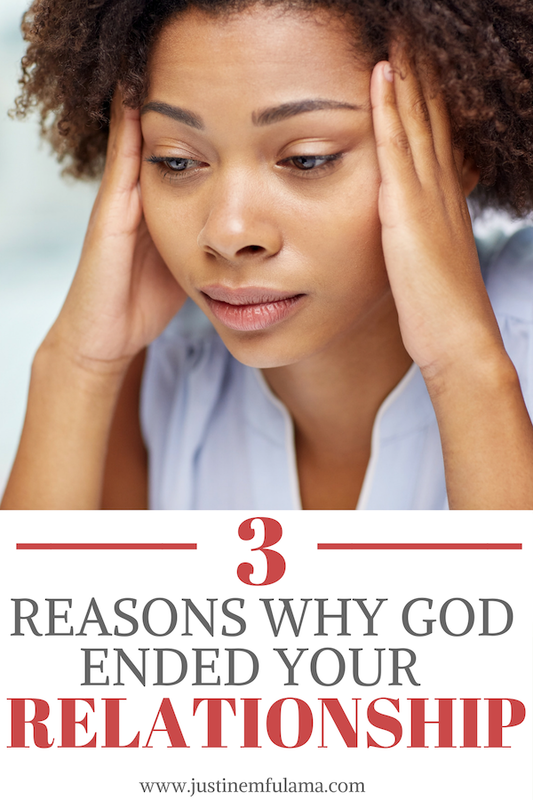 That’s why today I’m sharing with you 3 reasons why God ended your relationship. Do you know the difference between infatuation and Love? If not, then that might be one of the reasons why God ended your relationship. When I think back to my past relationships, I would describe them as emotional, intense and draining. Am I mostly using negative descriptions to make a point? Maybe. But once you read the definitions of infatuation and love you will get the idea. To break it down a little further, when we are infatuated with someone we feel like we are on an emotional high. We are blinded by our own desire for affection and their perfect appearance (so we think). Only problem, neither the feelings nor our current state of being are sustainable and doomed to die down. In contrast, when we are in love we agree to a long-lasting commitment to care for our partner. We are well aware of the other person’s flaws and don’t lean on them to make us happy. Moreover, our love for them remains strong, even when the passion and emotions of the beginning are gone. The second reason of the 3 reasons why God ended your relationship is closely linked to the first one, yet worth pointing out again. Idolatry is a sin we are repeatedly warned about in the Bible. An idol can be anything you desire more than God. It could be a physical object like money. It could be a status symbol like success or beauty. Or it could be the approval of people. For women, it is oftentimes the desire to be married. If your past relationship was the highest priority in your life and dictated almost every aspect of it, including your time, your focus, your finances and your walk with God then it was an idol. Mind you I’m not talking about the actual person (which is possible too), more so I am referring to the relationship itself or let’s say the relationship ‘status’. As someone who has a track record in getting into the wrong relationships (before I was serious about my walk with God), I can now honestly say that a lot of times I was in it for the wrong reasons. My main driver for pursuing a relationship was often times society’s pressure to be booed up. Making it work no matter what, became my focus and led me to compromise or even forget about my values and self-love. I repeatedly caught myself dropping my godly standards to accommodate his nonsense behavior. I wanted to remain in a relationship so that I could showcase it to my Facebook Friends and continue using hashtags like #hisandhers #bae #lovemesomehim etc. Stupid I know, but Instagram was life at one point. So how can you avoid making an idol out of a relationship and withstand its influence? By questioning your heart’s desire and getting to the root of it! Ask yourself why a relationship is so important to you and then give it to God. Once you understand the joy that lies in living for God and directing all your worship towards him you begin to love him so much that you refuse to pursue anything else but him. Most of us spend our lives trying to find love, trying to live in love but dying without ever truly discovering love. This quote is taken from a chapter in Leo Buscaglia’s book Love: What Life Is All About. It describes a very basic human desire to love and be loved. A quest every human being has been on at some point in his life. Even little babies long for proximity and emotional reassurance from their mother or father, which is provided through love. At first, I connected with this quote because I felt like it was the story of my life. I thought back to the many times I desperately tried to make a relationship work and failed. I thought I just needed more patience while waiting on God. But the more I thought about it, the more I realized that this quote wasn’t talking about LOVE but it was talking about love. The small, limited and worldly meaning of Love used to describe a relationship between a man and a woman. However, real LOVE is so much more than what we see in Disney movies and transcends the human definition. As a believer, we have the honor to know and be in a relationship with the author, creator, and embodiment of love. What God has done for us and how much he values each of our lives, is an act of unconditional love. That’s why when we give our lives to Christ we are blessed to truly discover love. A new relationship will only work if you discover God’s true love for you and love yourself as well as your partners the way God wants all his children to be loved. Maybe these three reasons played a vital role in your past relationships (I know they did in mine) and are the reason why God said no. Luckily you and I are still young enough to learn from the past and use God’s wisdom to guide us to a yes. 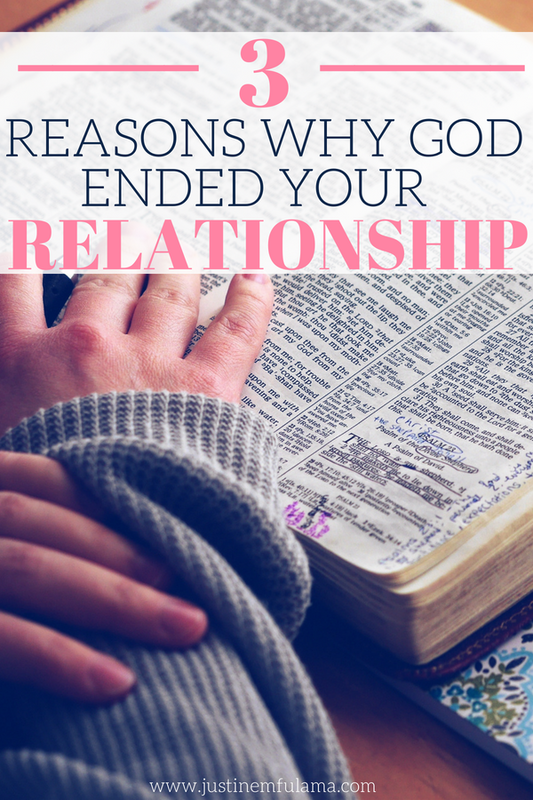 Do you agree with these 3 reasons why God ended your relationship? Comment BELOW! I’ve never been in a relationship before, but I can contemplate this to the other divisions of my life when God says no to some. I believe God say no for one good reason. He has a better plan, he has a better choice for us to take in the future. Maybe we rushed too fast in things. And God doesn’t like it because it won’t go well. Well, actually God’s NO is not always definitive otherwise there would be many desires from the past which we would never achieve! So God’s answer to your desires can perfectly be YES but sometimes the YES is only meant for short time to help us and this desire might just be a tranistion to something better. It’s like praying and looking for a perfect dream job and a new job occurs on your journey but it’s not aligned with your desire, so it might just be a transition to a better job opportunity. 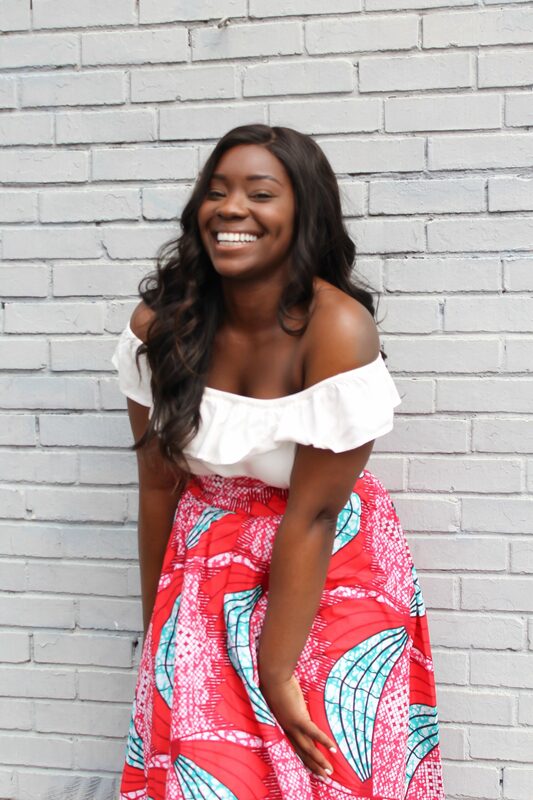 Hi Justine, my name is Emmy Young and I would like to Thank You so much for Understanding God’s No and helping me understand why he says no when it comes to relationships. I’ve been in two long term relationships, and one was my ex-husband, and the other an ex-boyfriend, in both relationships they happened to be very abusive, Thanks to God he led me the way out of both, I was so greatful!! So when you broke down the (why God says no) all makes sense to me. I love God with all my heart and soul!! With out him I would have probably had given up and had lost my life. Now I’m in a safe place and so greatful God has brought me back from the dead and restored my Faith in Love again! I’ve been relationship free for 2-1/2 years now loving myself again and it’s been a journey and a challenge! with God by my side each and every day I know he will bring the right relationship into my life! So I’m still waiting for God’s Yes???? Oh wow Emmy, I’m so happy this post helped you understand God’s no better. A lot of our challenges only make sense in hindsight, but I know God will use your experiences for his glory. I will definitely pray for you to be strong in waiting for God’s yes. Be blessed! This is written to singles…and yet…I know I’ve fallen into some of these traps in my marriage, too! great reminder at the beginning of the year…great even if God has said YES to someone…but it also applies to when God says NO to something! I easily fell into the trap of idolizing relationships – even friendships. God said no to me regarding a group of friends I had to give up, as they were not good influences. It was hard to accept God’s no, but I’m so thankful for it now that I look back and understand how poisonous those relationships were. I’ve been in the same situation before and even though it might seem hard, God’s best is always better than what we can imagine. This is actually something that I’ve been battling with. Letting go of toxic friendships and although I’ve tried to go back…it just no longer feels the same. My trust is gone in them and they’re no longer #1 on my list to call first. It hurt for the first couple of months. But God healed and now I’m just waiting for Godly friends who share the same theology and godly love for friendships the way that I do. What beautiful wisdom that you have learned. I can identify with what you have shared. It was only after I quit looking for a relationship that God brought me my heart’s desire. Psalm 37:4 Delight yourself in the Lord and He will give you the desires of your heart. I love that quote and absoltely agree!!! I think this post is a great reminder: even though we can’t see it, God always has a great reason when he tells us “no”. Sometimes we get to see what that reason is, other times we don’t, but regardless we can trust that God has our best interests in mind. God ended a relationship I thought was going to end in marriage. I didn’t understand it at the time, but now I realize that the day I got broken up with was the best day of my life. It led me to a much better, healthier relationship that did end in marriage. I look back now and realize that God knew what he was doing, even if I didn’t understand it at the time. Wow what a testimony. Thank you for sharing Ashleigh! From past experience, be it relationships, or not, I have seen God say no, simply because He had better plans in store for me for the greater good. I think when it comes to relationships, we need to first have a firm foundation of love and trust for God, and instead of searching for someone to complete us, or just someone in general, that we live life fully, and see where He takes us. Going through the same thing, my boyfriend of 4years recently said he needed space, I couldn’t believe it. He’s got so many issues with his work and also family. I couldn’t believe it. However Ive been feeling in my heart that right now we’re totally out of sync. I trust Gods plans for my life and I know at the right time he’ll bring us back together. I need to put God first in my life, to only worship His name. If we put our relationship with God first the rest of the relationships fall into place. I absolutely agree. If both og you keep God in the center of your lives, everything else will fall into place. At the end you will appreciate having a partner that has overcome his challenges and can trust God no matter what. Reading this makes me realize the things I did wrong. I idolized my girlfriend way more than god. Now that her and I are over, I realize that I don’t NEED her. But I still want her, I started going back to church after the break up, when I asked god to heal me he did it very quickly. Now, I still want to be with my ex because she’s a great human being, and honestly we never had many problems in the relationship, the break up was kind of surprising. But anyways, whenever I ask god if my ex was the one for me I get an overwhelming feeling of yes, just not right now, all over my body. And at night when I pray I ask him to continue giving me signs if she’s the one, and the next day or so I get a text or a call from her, or she’ll even come see me in person.. I think god just wanted me to realize he was more important and that he should come first, and now I do realize that. So is it possible he broke us up as a wake up call for me? And that he may put us back together ? I’m glad that this blog post could give you some understanding of your break-up. To answer your question, Isaiah 55:9 tells us that God’s thoughts are higher than our thoughts. So, neither you nor I can tell why the break-up happened. However, I am convinced that God always wants us to put him first, especially in our relationships. I feel like we’re going through the exact same thing. After the sudden breakup with my girlfriend of near 5 years, God showed me that I idolised the relationship more than Him. It’s been 3 weeks since the breakup, and I strongly feel that God wants us to continue to be together, but waiting is the hardest. God has changed me a lot since the breakup and I thank Him daily for it. But the waiting is extremely painful; but oh well, in His time. Justine, do you think God ever says no to say yes later? I am recently out of a relationship due to some mental/emotional issues my partner was working through. I have since pushed him to pursue the Lord to work through these things as I told him he is the only real source to our wholeness. However sometimes I strongly feel like we will be together again someday. I’m sorry you are going through that. I believe you need to do what is best for you and not be friends with him. That doesn’t mean you have to ignore him but get some distance. 6 months is a long time to still be hung up on him and I believe that it won’t stop unless you decide to exit the emotional rollercoaster. I hope I will once see if He really exists for me, I really do. thank you for sharing this with us. I believe God’s plan can be any of the above. However, I also believe that you should surrender this to him without planning your life according to an outcome. Move on from your past relationship by seeking God first and finding out what he wants you to do in this season of your life. Your past relationship had a very traumatic event happening and it’s important that you acknowledge and deal with that. Make sure that you heal completely while you are single so that you are ready for God’s best when he presents it to you. I recently cut off ties with someone I am affectionate about. I wouldn’t say it’s a breakup since we don’t actually have a label in the first place and I in part am too scared of commitments. But to be honest, I did cared for him. It would be a lie if I said that I wasn’t hurt and I did have an emotional downfall about it. I stumble upon your article and it did enlightened me. It really moved me and help me realized that maybe it wasn’t really loved in the first place, maybe it was just infatuation and that other societal factors did pressure me to going into this relationship. I really appreciate the insights brought up in this article. I must say, while reading I found myself taking notes and going down memory lane trying to understand some of the things that went down in a few of the relationships that meant a lot and lasted a while. I truly can see why God would says no and that my ” YES” is coming soon and like most things that contain love, I should be patient and wait on him…after all God’s time is perfect timing all the time!!!! I’m glad this post helped you identify areas you can work on next time. And I agree, if you invite him in and allow him to guide you, you will never look back and regret again. Thank you so much for the article. I was with my high school sweetheart for 5 years. We are both currently 24. We were each other’s first and everything. We were so happy until he started calling, texting, and seeing me less. I was confused and unsure what to do so I would ask “why aren’t you calling me?” “why aren’t you seeing me?” And so forth… He would say he was busy with work, or school, or his mom. It got so bad that we were only seeing each other once a week when we only lived 10 minutes apart. We never had infidelity issues and I’m sure that it was not that. Some people are skeptical, but like I said, I know. I just think that he had grown tired of me, of us, of the same routine. It has been a year and 3 months since the break up. He broke up with me in a long drawn out text basically saying that he wasn’t ready for kids or marriage which we had both disscussed enthusiastically in the past. He also said that he was so busy and his schedule wasn’t going to change, basically picking everything else over me. Wow was I hurt and confused. Living life on auto pilot was all I was doing but something happened in the first 3 months of the breakup. I got closer to God, felt His peace washing over me, refusing to let me be sad. I got a new job, I gained more confidence in myself, I got used to being alone and even began to enjoy it, i got to travel to a new place that I’ve always wanted to go, I was even able to realize my flaws in the relationship. I drank too much, I wasn’t very good with money, I was desperate for his love just to name a few but someone who loved me couldn’t just walk away from me because of those things could they? After he sent the break up text, I never heard from him again despite my pleading. Exactly a year after the break up i was in such a good place that I reached out to him. I texted him to say that over the course of the year I realized that it was best that we break up and I thanked him for letting me go and allowing me to find true happiness and I wished him the same. I wanted to be the bigger person. His response? “I’m happy for you.” And that was that. I felt a certain freedom and have continued to go on living my life for God. But lately, it’s been weighing on me again here and there. You know the rollercoaster of emotions, you think you’re just fine and then it all comes crashing back down on you again. Those days are hard but ive been able to make it through them. Until now, recently I fell very ill. I went to work this morning and my manager sent me home because of how bad I looked. Ive been fine for a while but a few hours ago, I fell into a deep sleep and i had a dream about him. It was just us, in a room, looked like a basement, but we were just hanging out, enjoying each others company like the good old days and we were in love too. It was so vivid and it felt so good to see him again. I woke up crying and I thought to myself, “I’m tired of being strong, I miss him.” I’m in tears as i type this now. And just thinking about how sick I am, I thought to myself “if anything happens to me and i go now, my perfect idea of Heaven would be first and foremost to be with God but secondly, it would be a place where my ex would want me again and we could be together, happily ever after. Ive often heard that when you go to Heaven and arrive at one of the many mansions, you get your room and your room is filled with everything you’ve ever wanted and so I imagine God opening the door for me and seeing my ex standing there, smiling, wanting me. I know it is too much to hope for but I wanted to share my feelings because, after i woke up crying, I went on an internet search as i have often done in the wake of the break up and its been articles like these that have helped me through a great deal. I put into Google “that God says about the man who left you” I was subsequently led here and so i just wanted to share my story and say thank you, Justine. Please pray for me, for him, for us. If there is an us to be. I’m not saying I’d take him back like that but I have developed a spirit of forgiveness and patience and it could happen one day. I may be a fool for hoping but I’m tired of being strong and pretending I’m okay when I’m clearly not. I miss that man but i won’t reach out, not because of pride but because i know that if it is to truly work out again, he has to want me and so i force nothing anymore. This article has been very healing and your words have been encouraging. Thanks again Justine. God bless you. Also, I tried to sign up for the email subscription but i got raked to an error 404 page? Id still like very much to sign up so please let me know ???? thank you so much for sharing. I think you are doing the right thing by surrendering the relationship to God and not forcing it. It’s been a year and you did well by using the time to focus on yourself. Continue to do so in order to build your self-esteem up and create a life that you love. There is no benefit in wondering ‘what if’, but instead let go. God told my beat friend(girl) that we can’t be together. After reading those 3 reasons why god says no. It made since. My questions is if me and her work on god and trust him and love him give our 100% could god “change” his mind and see that me and her have working hard to “idolize” the other and he could say yes? Like could his no but a no for the time being or forever? Hi Gabe, God is a God of grace. I believe that the best is to repent and do your best to glorify God with your relationship. I I’m a man that had to reply to your article and it helped me understand as a man that has to except God’s no. I’m glad this article helped you. I pray that you can forgive that person and move on. U know I met a guy online, long story short u wouldn’t think this happens to u on a Christian dating site ecsp after u CLEARLY state u want marriage and kids and follow Christ. Found out he was using me as a back up plan and was in love and waiting for someone else and just came online to use me till the time the love of his life said yes. I prayed God would take him away from my life but as months went on to almost a year God Dnt and I realized he was using me so I dumped him. I understand I kept stalking him on Instagram as I felt that was my only way to find answers, I disobeyed God and the man turned cold towards me. I heard God after almost a year to let him go , I obeyed. But I’ve been so angry and God and that man. Do u think if I prayed for that man to change that would be the best revenge ? Or do u think I’m disobeying God as He asked me to let him go. Any answers on this guys? Sorry guys I’m gonna repost as I wanted an honest opinion and realized I need to be detailed . I’m open to negative or positive feedback. I came out of a physically and emotionally traumatic relationship four years back which was for six years. After that I stayed single, I met some men but Dnt go for them as I was waiting on God for the right man to come along. I prayed and many men came along but I let them go as God showed me at a very early stage they weren’t good Christians. Anyways a year back rejecting a whole bunch of guys online I came across a man who contacted me and I quite liked him ( this is a Christian dating website) but as usual I prayed that God would take him away if he wasn’t right for me but God Dnt this time!!!! So I took a risk and went along with the flow. We met and he seemed to really like me and we dated a lot but hey, coming from an abused background and seeing my father ill treat my mom I Dnt have trust in this guy so even though things went well and I felt a lot of peace when we use to chat I stalked him a lot on Instagram and it became a bit too much !!! He Dnt ask me anything about my past or any deep questions which I found weird but after praying God still Dnt take him away so I Dnt look at it as a red flag. He told me he has a shy problem. So I tried to do my best to get him out of his shell. He told me his parents were missionaries and that he was a very strong believer. He is 11 years older than me. I’m 31. And he 42. After stalking him which I shouldn’t have done I discovered he only use to like two women’s photos from his entire friends list. One woman since 2016 and me whom he just met a year back. One thing is that I’m blessed with brilliant intuitions and have never been wrong .i realized he wasn’t in love with me after seeing this but with this women and was waiting for this woman and as soon as she would say yes to him he was gonna dump me. He Dnt make too much effort I felt in meeting me up after some months so I Dnt bother but when he continuously use to write me as it was long distance I took him seriously. I was moving to his country in exactly one year and decided to tell him after he told me he likes me very much and wants to have a serious relationship with me. He sounded happy. Then I stalked him again and realized this woman and him went to their home country at the same time. No pics together. When he came back he told me he likes me a lot but is unsure and couldn’t articulate why! I was furious and I knew I was his back up plan when he told me this. I ended it as I heard God say let him go. I know I was wrong to stalk to get my answers but how else would I know if he is another creep like my ex? I also couldn’t understand why God kept this going for so long if I was his backup plan. I was hurt with God and with him. Do u think if I pray for him to change that would be the best revenge or disobedience to God after God told me to let him go? Also I felt God tell me “His timing is perfect it’s better to wait a while and have things fall into place than rush and have things fall apart” also that he wanted to let go of him to avoid further future pain and hurt. Now after feeling this I was puzzled why God let me go through this mess again after my trauma is this guy is gonna be this bad ? Pls let me know what u think of this , and what these words I felt mean also whether stalking is it that bad if the profile is public anyways to get answers? Hey, Justine. I have been in an on and off relationship with a man. There were times when he constantly wanted to see me amd times when he didn’t even bother to text me for days. The problem was my happines depened on this guy. So there where days I loved life and days I just hated life respectivly. Last week I decided I will move away from him and find happines in God, because he is always there for me. And that journey is still breaking me to this day. Its so hard to just walk away from what you believed was your world just to find comfort that is everlasting. But the good news is. God is faithful and he is there for me, he restored my sleep and though I still hurt he tells me he loves me and will never leave. Hey Rebecca, I’m so glad you took the first step to breaking the soul tie between that man and yourself. Your happiness and self-worth should not depend on anyone else but yourself. By building a strong relationship with Christ you are taking the necessary steps to grown into the best version you can be. And if you need help with the next step, feel free to check out my 1 on 1 coaching course ‘Becoming The One to attract the one’.